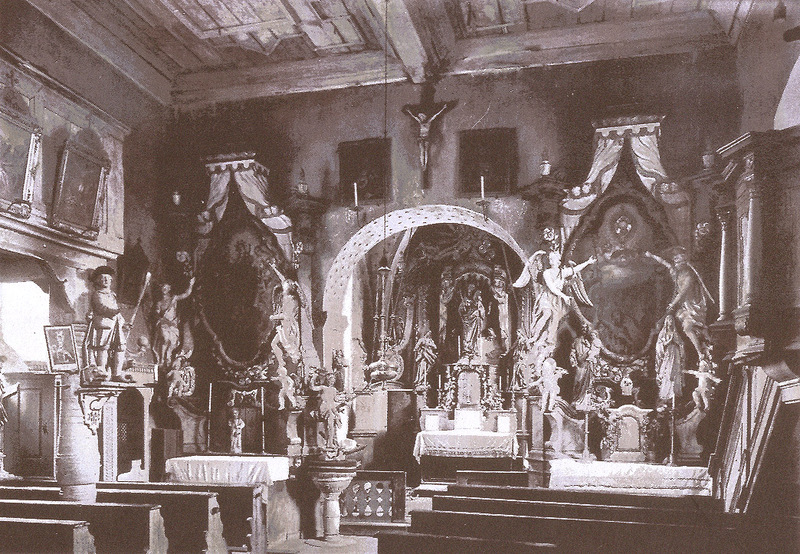 Interior of the Catholic village church St. Jakobus d. Ä. in Trossenfurt in Steigerwald, Unterfranken, Germany, in the 1920s. What had started in the 19th century was continued in the 20th century, but this time not as a question of style. In the decades between the great wars, the Liturgical Movement made the modernization of church buildings and church art primarily a question of theology and ecclesiology. 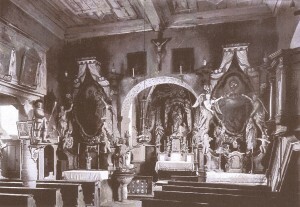 The movement wanted modern works of art, and its sometimes purist attitude towards the liturgical space influenced Vatican II. In return the ideas of the Liturgical Movement were sanctioned by the Council’s Constitution on Sacred Liturgy, 1963. In the immediate post-Vatican II era, puritan assaults became more frequent and more radical, amounting to what we may define as ‘practical iconoclasm’ in the service of good taste. The wave of redesigning, particularly in the 1970s, swept European churches – sometimes like a hammer annihilating most of the Church furniture, pictures, altars etc., replacing ‘kitsch’ accumulated over the centuries with new ‘tasteful’ and ‘theologically correct’ contemporary religious art. What was lost, however, was items pertaining to the devotional lives of people, item now found more or less isolated in various diocesan or folk art collections. The late Romanesque church in Trossenfurt in the diocese of Würzburg, dedicated to St. James the Greater, was enlarged and renovated in 1975 – yet fortunately a considerable number of pieces were allowed to remain in the church. Let us, then, take a closer look on this photograph, sticking to what we can actually see on an old photograph in a book. Looking from the nave, with its flat wooden 17th century ceiling, through the chancel arch and into the sanctuary with its Gothic cross-ribbed vaulting, one sees the main altar of the church. In the middle of the late Baroque altarpiece, above the tabernacle, a sculpture of the Virgin Mary with the Christ Child on her left arm while she is holding a sceptre in her right hand stands under a canopy carved like drapery. One of the two male saints with staffs flanking her at the bottom of the altarpiece right above the altar table is most likely St. James the Greater to whom the church is dedicated, the other may be St. Joseph. On the altar, three rather large altar cards are placed, and in front of the altar a simple, removable, wooden altar step is placed. In the chancel arch itself, a Franciscan saint is seen, perhaps the very popular St. Anthony. A low screen blocks parts of the access to the sanctuary. On the chancel wall, the eastern wall of the nave, above the chancel arch, a rather small crucifix is hanging, flanked by paintings of the Virgin Mary with her heart (north) at and of Christ with his Sacred Heart (south). A simple candlestick of iron is fixed to the wall below each painting. Close to the chancel arch, partly blocking the opening, what seems to be a movable baptismal font serves as a pedestal for a sculpture of the risen Christ. Two modest versions of the main altar flank the chancel arch as side altars. The northern side altar shows St. Christopher carrying the Christ Child, surrounded by adoring saints. On the altar in front of the tabernacle door stands a statue of the blessing Christ child. The southern side altar seems to have been dedicated to the souls in Purgatory, showing a Monstrance with the Host raised above souls surrounded by flames. At the bottom of the altarpiece and above the tabernacle, two large probably 19th century statues of St. Joseph with the Christ Child and a praying Virgin Mary (Lourdes-type) flank a small statuette of a cleric – it may be St. John Nepomuc with the dragon of slander at his feet. Against the southern wall of the nave we see a part of a 17th century pulpit. On the opposite side a north transept has been added to the nave. In the northeast corner of the nave, between transept and northern side altar, the congregation has managed to squeeze in a confessional. In front of the northern wall in the nave a gallery protrudes, supported by columns, one such column standing between the pews. On the column a statue of St. James the Greater is placed facing south, and on the same column facing west hangs a framed engraving with a “Vesperbild”. On the parapet of the gallery stations XI and XII of the Way of the Cross are placed. Each painting is framed – a wooden piece with the number of the station and a cross added on top of each frame. To light each station an iron candle stick is placed below the painting. Station XIII, Deposition, hangs on the northern wall close to the chancel wall – the 14th and last station, then, perhaps hanging in the sanctuary. From the beam in the ceiling of the nave hangs a rather large silver(?) lamp of some kind, perhaps for oil or incense, or perhaps even with the eternal light to honour the most Holy Sacrament in the tabernacle on the main altar. A multitude of pictures, sculptures and other objects crowd the church interior – offensive to the purist taste of the Liturgical movement, but a goldmine to anybody interested in the instruments connected with the ecclesial and devotional life of this rural parish in Bavaria.